The base in the photo on the left is a high quality Blackwood base, but it has become cracked, making it next to impossible to hold a pole firmly. How does this happen? The most likely cause is ice damage. If you use your poles year round and you live in a climate where the winter temperatures fluctuate between freezes and thaws, then you need to take care to prevent this kind of damage. Rain will enter the top of the open pole, and accumulate at the base, unable to escape because the base has a solid bottom. When the temperature drops, the water freezes and the expansion cracks the base. 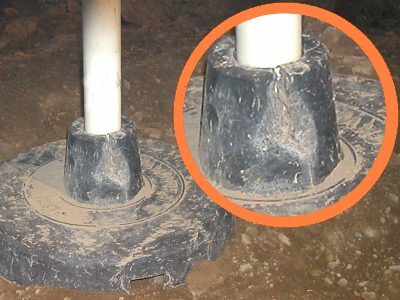 This problem can be avoided by cutting a drain hole in the center of the base in the pole socket. The Josey bases come with the bottom open. The O'Neil bases don't seem to have the problem, perhaps because of their more flexible structure. But the Blackwood bases need this modification. 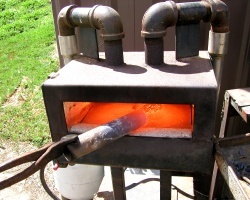 Using a forge to heat the tubing. The rubber at the base of the socket is about 1/4 inch to 3/8 inch thick with what appears to be nylon thread moulded in. You might be able to cut the hole, but I've found that burning works well. 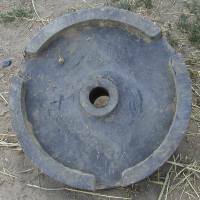 I start with a piece of tubing of a diameter smaller than the pole socket, and sharpen the rim with a file, on the inside preferably. You could heat the tubing with a torch, but I happen to have a forge and it works really well for this. Burn it through with a rotating motion. 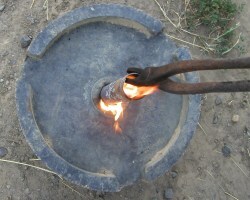 Center the red hot tubing over the socket base, bottom up, and rotate slightly back and forth as you apply pressure to burn through.